How Crowded Is Petra During The Day? 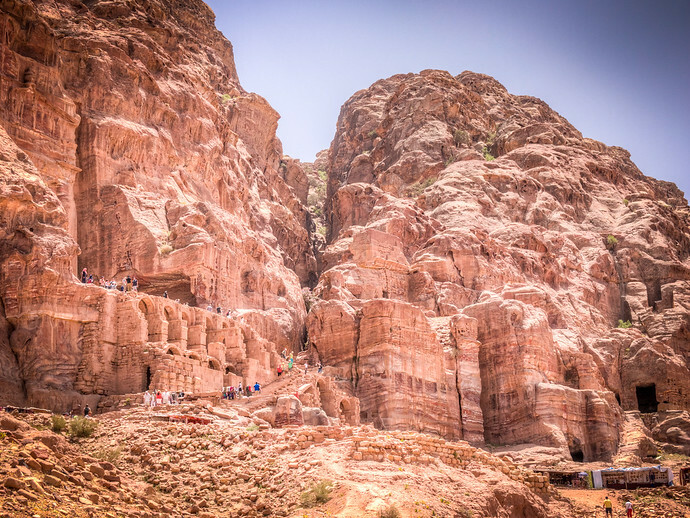 The ideal way to visit Petra is to arrive one night before, stay at one of the plentiful hotels, and enter the site as soon as it opens at 6am. 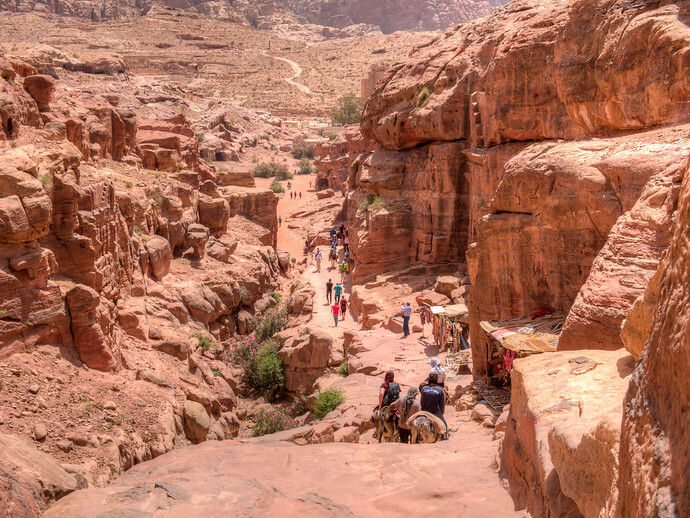 Petra enthusiasts generally recommend staying two days to be able to fully explore the entire site but if you’re planning on a day trip from Amman, you’ll likely arrive when Petra is at its busiest during the day. Large crowds and people in all of your photos might have you worried that not getting to Petra at 6am will ruin what is a bucket list event. Many of the tour buses from other parts of Jordan – mainly Amman – arrive around 10am and in case you’re on one of them, watch the video here or read on for what to expect. 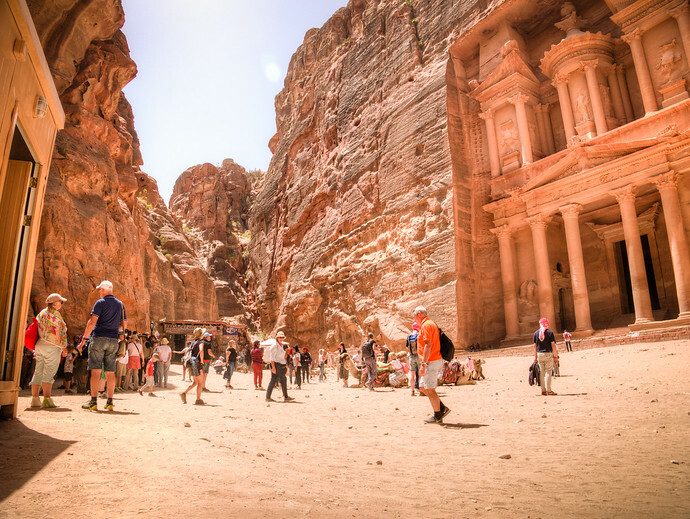 Late morning is generally the busiest time at Petra when people taking day trips begin to show up. 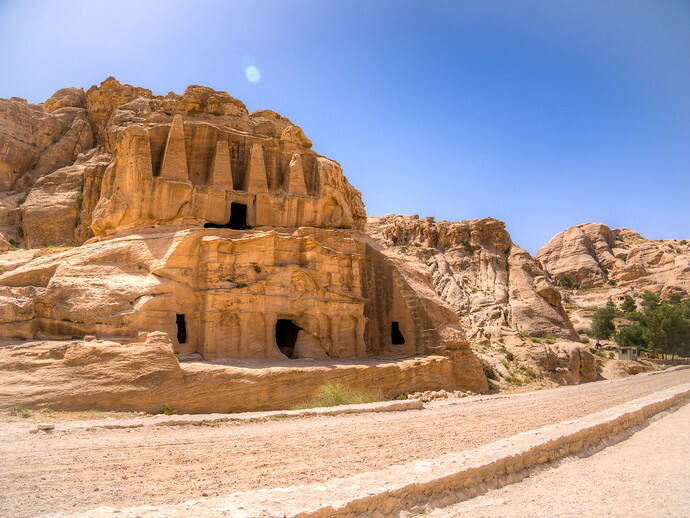 For a day trip to Petra from the Jordanian capital Amman, the JETT Bus leaves at 6am, arrives at 10am, and returns around 5pm (definitely check the times on their site to be certain). JETT’s online booking engine is very unreliable so at least a day before your trip to Petra, visit their offices in Amman to book tickets ($32USD round trip). There are certainly other ways but this is the method I used. Petra is a large, large area. The town itself isn’t too big but the historical part is much more than just the famous treasury. 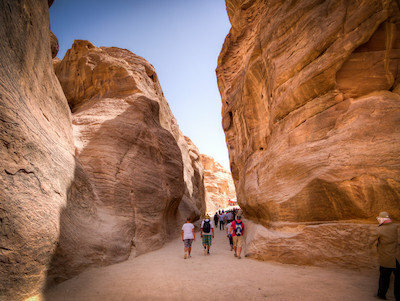 The iconic treasury is a 2km (~1.24 miles) walk from the main entrance of Petra and its only the beginning. From there it’s another 6-8 kilometers (~3.7 – 5 miles) to the rest of the sites. Hopefully some of the pictures I’ve taken give you a better idea of how expansive the area is because just reading it doesn’t prepare you. For those of you who can’t stand people in your pictures standing in front of the treasury for 10 minutes should give you a fairly clear shot. A wide angle lens will make matters easier and if all else fails you can just remove the people digitally. To be honest, even at its peak you won’t feel like it’s crowded at Petra. Plus the people in your photos can also give perspective, showing how big everything actually is. Remember, around 2pm, the school buses show up. The kids stick to near the treasury and just beyond but while you won’t feel more crowded, the ambient noise will increase by about 5000%.